Here's a dish that I hadn't even heard of until I met my husband. We used to make it pretty frequently our first few years of marriage, but then we got away from it. It's never been one of my favorites. I think that may be because I used a canned cream of chicken soup shortcut for the gravy, though. Tonight when my husband suggested we have it for dinner, I went the extra two steps and made a gravy from scratch. 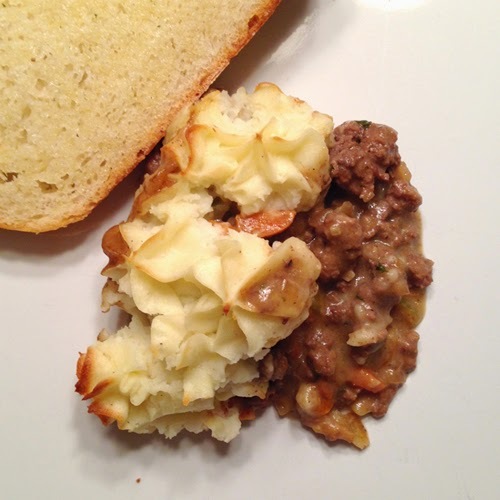 That was a good move, and we all--even my picky eater--really enjoyed this shepherd's pie. So there. My other kid said, "It's kind of an olde tyme (time-ee) kind of meal." Hmmmm. An interesting observation. This meal is warm, comforting, salty, and hearty. It's not fancy, although you can make it fancier by piping the potatoes on top. It's just a good meat and potatoes meal that made my husband happy. 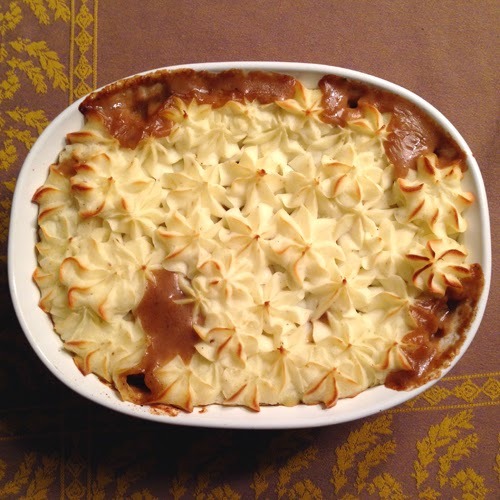 Maybe this shepherd's pie can make you happy too. 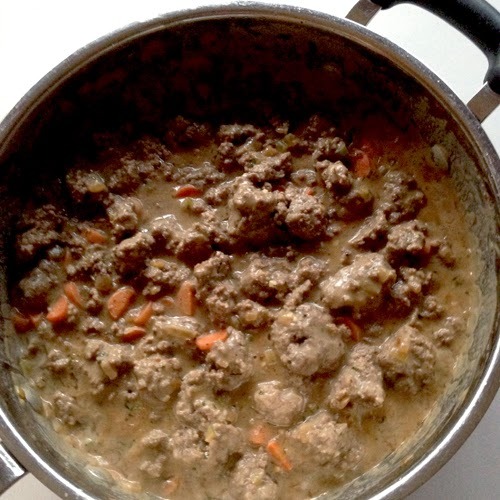 In a large saucepan over medium heat, brown the ground beef, making sure to leave some of it in larger bite-size chunks. When meat is basically cooked, use a slotted spoon to remove the meat to a plate or bowl. Set aside. Continue to cook drippings until it sizzles because there is more fat than water. Add the butter, onion, carrots, and celery. Turn heat to medium low and cook veggies to desired tenderness (I cooked mine until the carrots were al dente). Add the garlic, parsley, thyme, and pepper. Stir and cook for about 1 minute. Add the flour, stirring and cooking for about 1 more minute. Whisk in beef broth making sure to whisk away lumps. Bring gravy to a simmer, add half and half and return the ground beef to the pan with the gravy. Turn heat off and set pan aside (or leave on the burner that's been turned off). Prepare mashed potatoes by cutting peeled potatoes into 1 1/2 to 2 inch chunks. Place in a large pot, cover potatoes with water, add salt, and cook on high for about 25 minutes, or until you can easily stick a fork in the potatoes with no resistance. Carefully drain off the water and return to the heat for about 1 minute to evaporate any remaining water. Heat the milk and butter in a microwave safe bowl or cup until hot. Beat potatoes with a mixer until potatoes are broken up. Add the hot milk & butter mixture and beat until smooth. Add sour cream and salt and pepper to taste, and beat to incorporate. If the potatoes seem too thick, add a little more milk and beat until smooth. Place meat/gravy mixture in a medium baking dish. 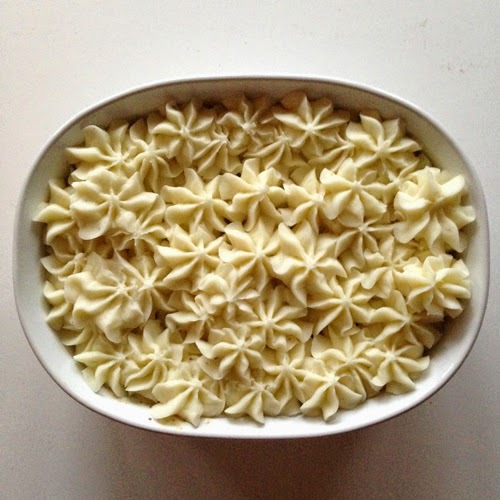 Top evenly with the mashed potatoes (I used a piping bag with a star tip just for the fun of it). 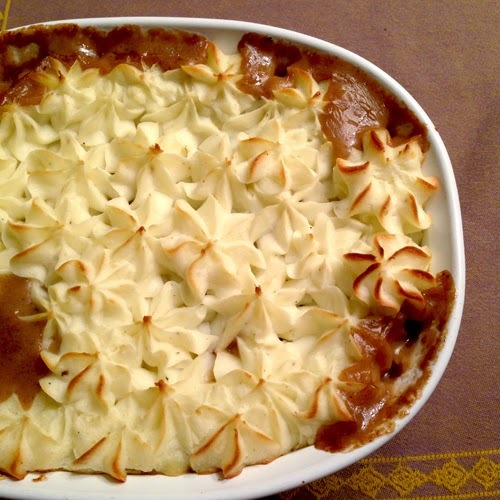 Bake at 375 degrees for about 30 minutes, or until gravy bubbles at the edges and the top begins to brown. Allow to rest 5-10 minutes before serving. *You really want to end up with about 2 1/2 to 3 cups of mashed potatoes to put on top. The type of potato you use does not matter. Yeahh! First commenter :)- I just made this and WE love the gravy. I did double the veggies and added fresh corn. Next time, I think I will double the gravy..sooooo good, thank you for taking the time to post all these delicious recipes!